Christine has just said that she would give her eye teeth not to do today again. The adventure started before we even left the hutte. All through the night a storm raged and, as the fifteen or so walkers gathered for breakfast glances' suggested, no one was desperate to step out into the gale. We were wrong footed, we thought everyone was about to go only to discover that we in fact were the pioneers. The first thing to hit us was the wind. The hutte is in a very exposed location and as soon as you stepped away from the immediate shelter of the building you thought you were going to be knocked over. Not helpful given that the path we had to walk along was narrow, stoney and wet. We hesitated, thought about going back into the hutte, but a retreat was just too embarrassing so we pressed on. The second thing to hit us was the cold. It was hailing and despite having all my gear on, my hands and feet quickly got cold. 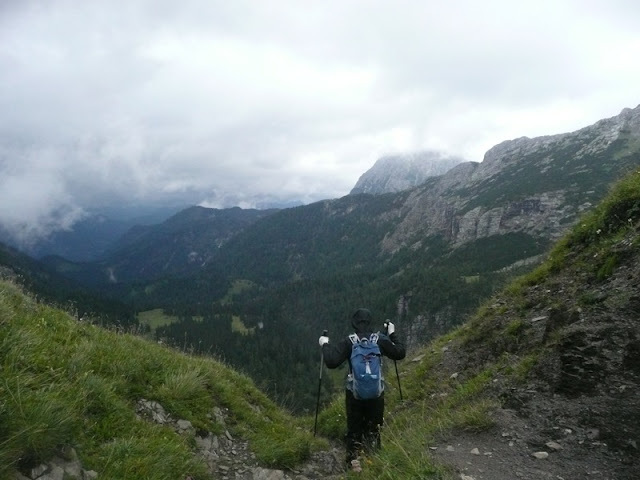 Fortunately the first part of the walk involved a 300 metre climb over a ridge at Sulzkarhund and the effort of the climb warmed us up. After an equally steep descent down into the valley to Sulzkaralm on the other side of the ridge things started to settle down just a bit. The wind dropped and the rain and hail died away, we even got an occasional glimpse of sun. Perhaps the worst of the walk was over. 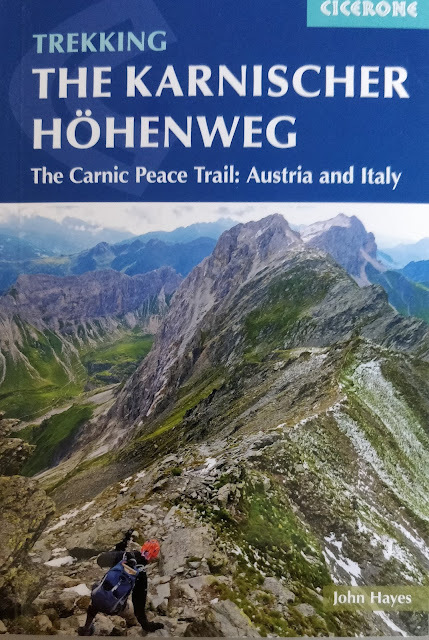 In fact by the time we got to the bottom of the valley, having dropped from 1800 metres down to 1100 metres, the walk was almost getting a bit boring if not necessarily comfortable. It was still drizzling and the cloud was hanging low limiting the views of the mountains to occasional glimpses. The route took us in a semicircle on a forest road making for a easy climb back up to 1400 metres. Things then started to get tougher. The first challenge was a climb through a recently cleared forest. 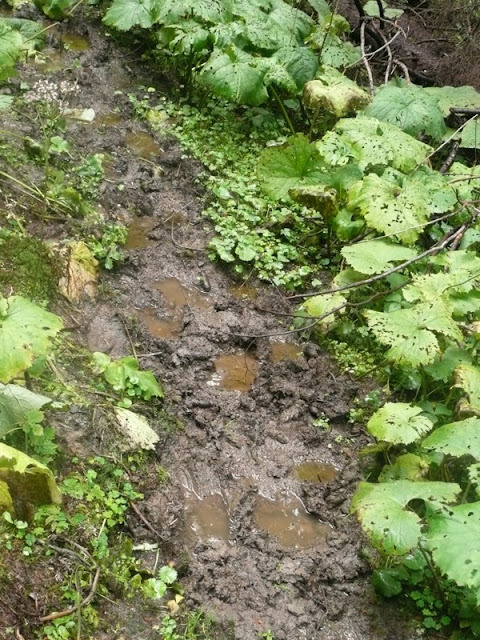 The track was hard to follow through a mess of left over branches and churned up ground. 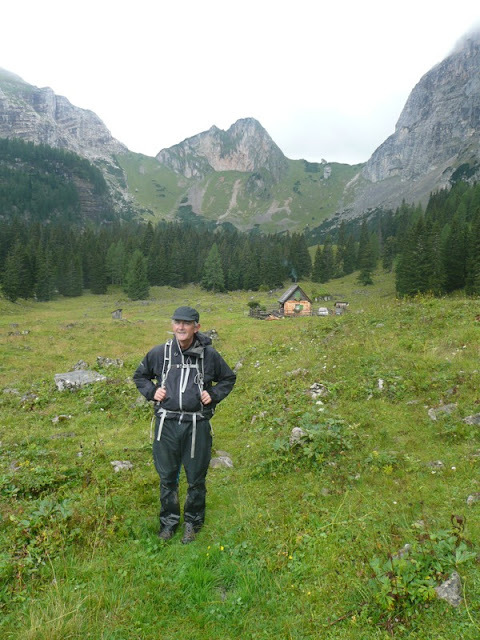 The next challenge was a two kilometre climb up through water logged meadow where the path had been trampled by cattle. By the time we got past it our feet were completely soaked. 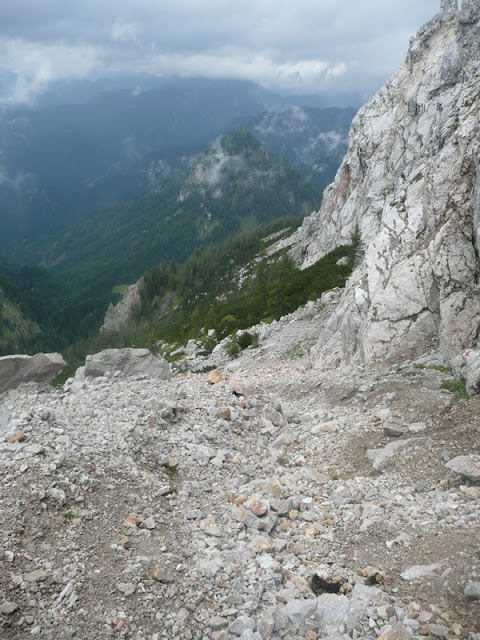 The climb took us right up to the face of the Lugauer, a sheer cliff rising up to its summit about 500 metres above us. We were now back to 1700 metres and the official E4 route dropped down 1000 metres to Radmer a couple of kilometres away. Christine refused to believe the way it was taking us. 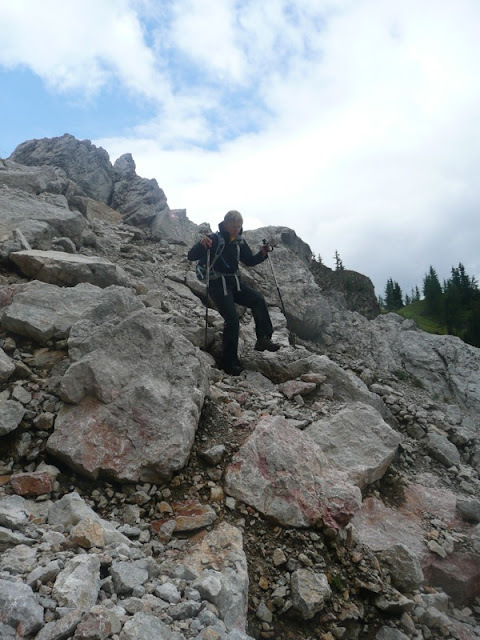 The first part of the descent ran steeply down unstable scree down the side of the summit face. Very scary walking. Rocks the size of medicine balls moved as you stepped on them and made you feel that everything could fall away taking you with them. Far below was the valley and between it and us was a huge drop. Both of us would definitely have preferred to be somewhere else but with no choice we just inched our way down the 20 minutes or so it took us to get past this moving rock field. The rest of the walk down was a lot easier but still a challenge. It was obvious that this is a path not often used. Wet vegetation was waist high making it hard to spot hazards (roots, holes, rocks) below. Above all it was slippery with both of us crashing to the ground several times before at last we hit a forest road just above Radmer. 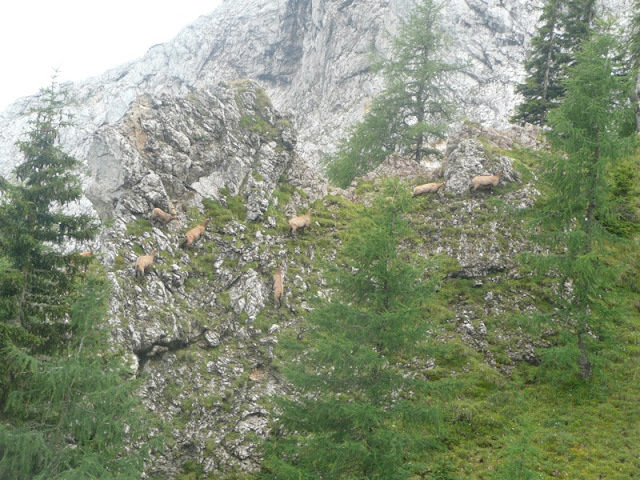 Saw lots of wildlife today by the way, particularly deer and chamois. Got particularly close to a family of chamois scrambling over rocks just before we started the dreaded descent underneath the Lagauer. Fortunately we found the gasthof in Radmer quickly, got out of wet things and had a shower. The weather forecast is better for the next three days a least and perhaps we can have a few easier days. What a day - but you survived and it's behind you now. If the E4 is ever going to take off as a major pathway, it's going to need a few modifications. Good luck for the rest of the walk. It's not long now and we're all looking forward to welcoming you back.